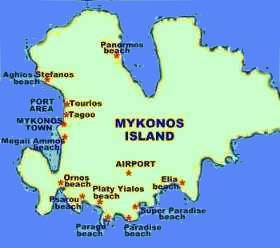 Mykonos being the most unique of islands, makes an ideal island for sun worshippers, beach and FUN lovers! The Cyclades easily the most visited and famous of the island chains. Each summer thousands of tourists take the ferry boats as they play between the numerous islands that make up the Cycladic group. Santorini and Mykonos take the lions share of visitors - who come to marvel at some of the most impressive views in the Mediterranean or revel in wild night life. But the enduring benefit of these islands is their proximity to one another - thusisland hopping has become an established pattern. While many desire nothing more than to drift around the Aegean until an island takes their fancy others are intent on seeing as many as possible during their stay. With such a rich array of uniquely different choices the Cyclades look set to remain the destination for visitors who want to be able to experience the crazy, the quiet, the famous, the historic, the beautiful and the exotic - all in a week!